# Dice the onion into small pieces and knead these pieces with salt to soften them. Transfer them into a bowl. 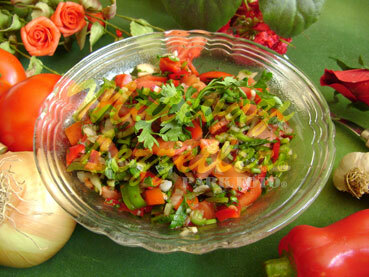 # Add small tomato pieces, small parsley pieces, fresh mint, red and long pepper pieces into the bowl. Mix it. # Mix pomegranate syrup with water, dried mint, sumac and red pepper in another bowl. Then, pour this sauce all over the salad. # You may serve the salad half an hour later. Note: At the traditional Gaziantep Salad, oil is not added especially.